An ideal destination for leisure travellers. Shells On The Shore Holiday Accommodation that ensures your warm welcome is heartfelt whilst providing an exotic accommodation and world class service for an enlivening vacation. Enjoy a whole new travel experience in Port Stephens by residing at the Shells On The Shore Holiday Accommodation, distinguished by particular and outstanding high-quality decoration and furnishings, all the 3 well-appointed accommodation units are equipped with appropriate amenities to ensure you a restful as well as a pleasant stay. Shells on the Shore is affordable family accommodation at it’s best. Features waterviews, Air-conditioning, Foxtel, DVD, laundry, entertaining area with BBQs and close to all your holiday needs. A variety of treatments are designed in the soothing spa to awaken your senses and restore the natural balance of the body that promises an experience of transformation. Find some free time to explore the various attractions of this beautiful city that are waiting to thrill you. 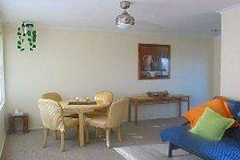 Shells On The Shore Holiday Accommodation, just 200m from Fingal Bay Beach.